Five years ago, director Ridley Scott returned to the Alien franchise with Prometheus, his attempt at giving a back story to the titular creature. The movie received mixed reactions from audiences with many praising the story and sets, while others criticized the characters and felt the film to be unnecessary. After working on a few other films, Scott decided to continue his new story with Alien: Covenant. Will it be an improvement over his previous entry or will it fall into the familiar ruts? Unfortunately, Covenant does share the same problems Prometheus had and those problems begin with the film’s story. The story follows the crew of the ship Covenant which is transporting two thousand colonists to another planet. After a disaster leaves the captain and a few dozen passengers dead the crew finds a nearby planet that is even better then the planet they were heading to and decide to land, mainly because their destination was still several years away. While there the crew encounters numerous horrors and we learn how the xenomorph came to be. The major problem with the story is that Scott seems to be far more interested in philosophical and religious ideas, so much so that he doesn’t properly develop his own story. The beginning is rushed, not giving us any time to get to know the characters or properly have them developed so there’s no emotional connection to them whatsoever. Once the crew gets to the planet it’s mainly just them wandering around aimlessly and occasionally bickering with one another. There are moments of horror when the xenomorphs finally come into play and these moments are well made, being viscerally unnerving rather then actually scary. In a way though that is a shame, some tension building truly could have made this film unsettling. These moments of horror truly help break up the monotony but once David from the previous film reenters the story goes back to it’s philosophy and ideas on creation, religion and one’s place in the universe. The third act of the film is thankfully entertaining with some entertaining and well made set pieces and a finale that is wonderfully reminiscent of the first film. Funny how the old formula is the best aspect of the film while the philosophical nonsense hinders it greatly. The characters for Alien: Covenant are mostly underwritten and forgettable. A majority of the characters have no proper development, heck they don’t even have a proper set up or characterization. Many of the characters don’t do anything save for existing to be fodder for the xenomorph. The truly aggravating part of this is that there was actually some character development that was cut out of the film and used as promotional videos on Youtube, something I imagine many viewers avoided so as not to be spoiled. it was a foolish move to have such important scenes cut out, it’s like senseless homework you have to watch all the videos before you see the film otherwise you’ll be completely lost. There are a handful of characters that have some form of writing to them. Our main character Daniels is likable and an overall decent character. she isn’t memorable but the choices she makes and her actions are far superior to her predecessor from Prometheus and that’s enough to make her OK.
Tennessee, the pilot for Covenant is a pretty good character in that his main drive is to save the other characters despite the risks to himself, the crew and the passengers. Captain Oram could have been a truly interesting character. We learn early on that he is a very religious man so much so that he feels he isn’t respected because of his faith and it’s that fear of not being respected that leads him to do foolish and mean spirited actions. The problem is that Oram’s faith never comes into play. No one ever mentions it or says it’s an issue. It’s so pointless that at one point he says that as a child he saw the devil and leaves it at that. What did he mean? Did he encounter a person so evil that he saw them as the embodiment of the devil? Did he see the actual devil? Who knows the line is never brought up again and Oram goes about like so many of the other characters: With no purpose or development. The most interesting characters in Covenant are the androids David and Walter. While it is irksome for the film to go back into philosophical overdrive once David returns I must admit that these scenes weren’t so bad. He has interesting ideas, is truly the only person who should be questioning his existence and purpose in the universe and it subtly and slowly reveals his true evil intentions. As the true villain of the film David truly is an intimidating and engaging force as he’s shown to be a madman with delusions of grandeur, seeing himself as God of the Old Testament. Walter is a different story. Walter is the newest model Android and is programmed to lack emotion and function through logic. By all intents and purposes he could have been the villain compared to David’s emotional personality. What’s odd is that Walter is shown to an extent to care about the crew so where do these feeling come from if he was programmed without them? Once again it’s something that’s never explained or delved into. Acting for Alien: Covenant is mostly good from some of the main cast. Katherine Waterson does a fine job as Daniels. She manages to give a decently emotional performance in the first act and is believable and enjoyable in the role. Danny McBride, surprisingly, gives an utterly fantastic performance. It seemed an odd choice to hire McBride of all people considering he’s only ever done comedies but in a dramatic role he is incredibly splendid being one of the most memorable aspects of this film and stealing the whole show. Michael Fassbender does a great job as David and Walter. As David he’s once again unnerving as you know something is up with him and even when he pontificates about philosophy he still manages to be engaging. As Walter it’s a completely different performance. Fassbender has to adopt an American accent which he does well and has to be more restrained and quite which is an interesting juxtaposition to his performance as David. What;s more interesting are his interactions with himself and humorously enough Fassbender seems to work better off of himself then the other members of the cast. James Franco has a very brief cameo in this and it’s utterly disappointing. It was an interesting idea to get rid of him so early in the film but there are no other scenes of him in the film so his presence is pointless. Do you know where all of his scenes went? That’s right Youtube! In hindsight that was a really bad idea. The effects for Alien: Covenant are very good. Like it’s predecessor the effects, landscapes and sets for Covenant are absolutely gorgeous. The scenery is a beautiful sight to behold and creates the illusion of peace on what will soon be a violent world. The sets are well designed and are eye catching with Scott actually managing to re-capture the sense of isolation and claustrophobia in scenes that are wide open and the confined. 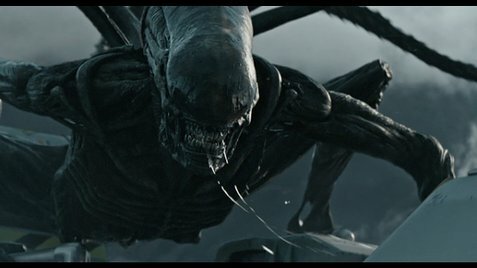 The effects are also very well done and the CG is appealing and blends nicely with the world around it but there is a problem with the design of the xenomorphs. The problem is that they’re CG creations instead of people in suits and that is a massive problem. In doing so the xenomorphs lose everything that made them scary, looking real while being both animal and human. Here even with the impressive work of Javier Botet as the xenomorph they still choose to give them more human aspects such as walking upright. Because of this the effect is now obvious and they stop being scary monsters and instead become effects. Final Thoughts: While Alien: Covenant as some truly good things to offer such strong acting from some of the cast. great effects and a truly entertaining third act there’s just too much weighing it down. The story is weak as it focuses more on philosophy rather then developing it’s characters, many of the characters are forgettable and one dimensional and the titular alien itself isn’t’ itself anymore. In the end I can only really recommend this for people who love the Alien franchise. Go on a lazy afternoon with some friends and see it, who knows you may appreciate what this film had to say more then I did. But in the end all it really is is Prometheus with a new paint job.